Did you know Scandinavians are some of the happiest people on Earth? In a land of extremes and seemingly endless days, it's no wonder the Swedes embrace the comforts of home. But it's also their love of nature, the celebration of seasons, and an eye for lively design - respecting both form and function - that the Scandinavians have mastered. It's the balance and simplicity of life and things when we crave calmness in a chaotic world. There's no word for this feeling in English, but the Swedes have the exact one and it is lagom, or "just right." In her new book Live Lagom: Balanced Living, the Swedish Way, author Anna Brones says, "As we strive to manage our busy everyday lives, lagom might just be the key that we need to unlock a more intentional, balanced, healthy lifestyle." Indeed, our fast-paced lives, our never-ending to-do lists, the unreasonable expectations we place on ourselves leave us burned out and craving something meaningful. Brones says these things have both a social and environmental cost. As we meet our personal, social, and environmental limits we begin to ask what changes we can make and how we can live better lives. Applying the notion of lagom to our everyday lives - from what we eat and to how we work - will lead to a more balanced, sustainable lifestyle rather than one that focuses on consumption and keeping up with the Jones'. 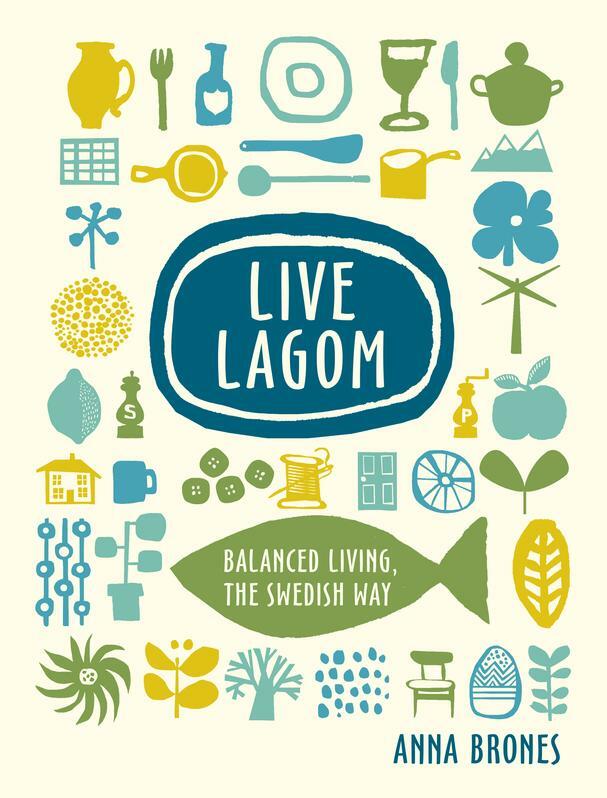 Just reading Live Lagom gives me a sense of calm, a longing to embrace a slower pace of life. Lagom is an ingrained way of life for the Swedes but Brones' book will get you started and soon you'll be living lagom at work, home, for health, and the environment. Rather than ask yourself how you can work less, ask how you can work better? Knowing when to take a holiday is just one simple tip Brones gives to achieve balance at work. Brones explains the importance of functional design and architecture in Swedish homes. Creating a feeling of comfort, coziness, and nurturing spaces - or hygge - is integral to Swedish design. She gives tips on how to create hygge (comfort) and incorporate lagom (balance) room by room (as well as some DIY tips like making paper lampshades and printing with leaves), and how to bring a sense of lagom to your fashion. In food and drink, Brones explains the core components of a Swedish pantry and the basics of Swedish cuisine (local, fresh, whole foods). 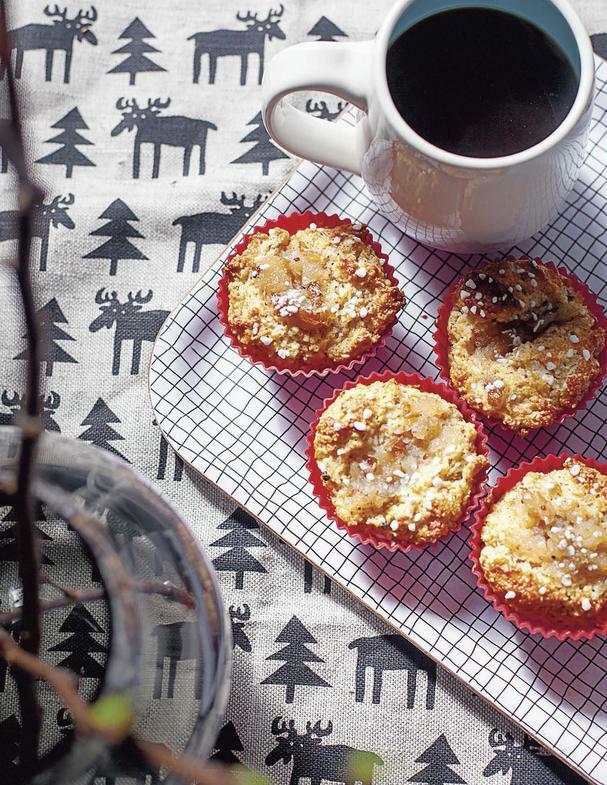 She includes some quintessential Swedish recipes, like the gluten-free filled cardamom buns featured below that are perfect for the holiday season. In lagom for health, Brones says it's both a mental and physical state of mind and involving moderation. It's not about focusing on what we don't have but rather the appreciation for what we do have. Simple but effective tips include minimizing the mental clutter, unplugging, and connecting less online and more in person. Make a nice cup of tea and a bite of something sweet, grab a fuzzy blanket, a good book, and curl up for a few quiet moments in front of a fire. Congratulations, you've just practiced hygge and lagom! Don't you feel good? Preheat the oven to 450°F/225°C. In a bowl, mix together the almonds, rice flour, sugar, baking powder, and cardamom seeds. Cut the butter into the mixture in small cubes and work together with your fingertips until the mixture resembles coarse breadcrumbs. In a separate bowl, whisk together the egg and yogurt. Add to the dry mixture and work together until a dough forms. Spoon the dough into silicone or paper muffin liners. Using your finger or the back of a spoon, make an indent in the middle of each one. Place about a teaspoon of the jam into the indent or mix together the butter, cinnamon, and cardamom and add a teaspoon of this filling. Sprinkle with pearl sugar, if using. Bake for 12–15 minutes until the tops are a deep golden brown. Remove from the oven and let cool for a bit. Serve warm or let cool completely, then store in an airtight container. Reprinted with permission from Live Lagom: Balanced Living, The Swedish Way by Anna Brones, copyright© 2017. Published Ten Speed Press, an imprint of Penguin Random House LLC.